The digital economy is now expanding rapidly, and is starting to overturn the past achievements of the Industrial Revolution. Initially engaging in the world of services, it is now turning to the manufacture of objects. Just as microcomputing evolved from large scale computing to more personal use, and as the Internet left behind the world of armies and universities to become universal, industrial… production is gradually becoming directly controlled by individuals. 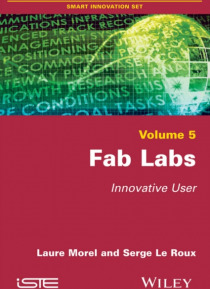 This appropriation is being done either on a personal level, or, more significantly, within local or planetary communities: Fab Labs. These digital fabrication laboratories offer workshops to members of the public where all sorts of tools are available (including 3D printers, laser cutters and sanders) for the design and creation of personalized objects. The bringing together of various users (amateurs, designers, artists, dabblers , etc.) and possibilities for collaboration lies at the heart of these open-access productive spaces. This book covers a range of advances in this new personal fabrication and various issues that it has raised, especially in terms of the alternatives to salaried work, intellectual property, ecological openings and the hitherto unseen structuring of societies.